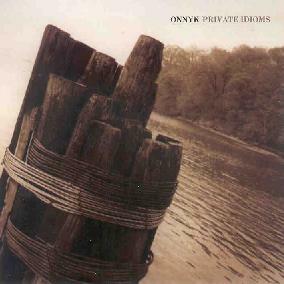 Onnyk is the moniker used by Japanese free-improv guitarist Kinno Yoshiaki. The CD consists of a 25 minute track recorded at a gallery in 1995 and a 30 minute track recorded in Yoshiaki's living room in 1997. It's all solo guitar workouts that are pretty firmly in the Frith/Bailey school of improvisational guitar, and Yoshiaki displays a fairly impressive level of proficiency on his instrument that allows him to be simultaneously abstract and expressive, as well as being able to keep things interesting throughout these lengthy performances. He does utilize some noise and harsh scratching techniques, but for the most part we hear good clean playing that makes it easy to zero in on the details of intricate fretboard runs and individual notes and tones. It certainly helps that the recording quality is good. Yoshiaki likes to continually evolve through various patterns and styles (not always so seamlessly), from standard off-kilter freeform guitar, but also including jazz and rock influences, as well as bits of Blues. There are a lot of really good free-improv guitarists in the underground but not many of them can consistently hold my attention throughout such lengthy tracks as Yoshiaki has. But with such a clear and usually precise playing style, there's plenty for the attentive listener to focus on and dissect, making this an enjoyable and challenging hour of avant-garde solo guitar.